This was taken during a recent photo shoot for Plaza Uomo magazine in Sweden. I think the only time I have shown the jacket before I wore it open-necked (blue shirt and navy crew neck, with charcoal trousers). It is not an easy pattern to accessorise, though one tie colour that certainly goes is black, going off the colour of the check itself. 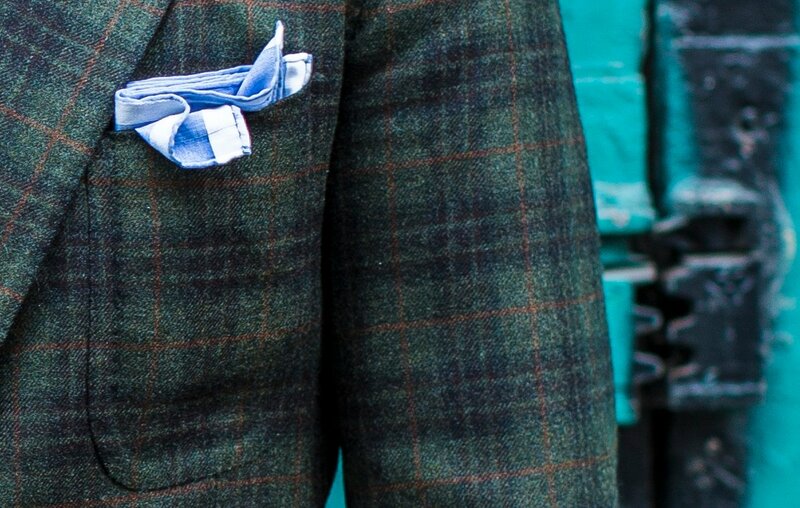 Looking for such minor colours in the pattern or weave of a jacket is a good place to look for potential accessories. Sometimes it is more obvious – as here – and other times – as with the weave of my Rubinacci donegal, you have to look a little closer. It’s particularly worth looking for black in trouser cloth, as large sections of black in a twill or houndstooth will often restrict it to being worn with black shoes. Brown just won’t look right, but the reason won’t be obvious. The jacket cloth is from the old Caccioppoli A/W bunch. It was not my first choice – I remember I originally wanted a grey with a brown overcheck that sat next to it, but it was sold out. In retrospect this was the more interesting choice, however. That grey/brown check would have sat much better with brown shoes and paler trousers, and this one requires blacks, charcoals and dark navy. But once you have learned how to wear something it’s no harder to put together. I’ve learnt that the trousers have to be a relatively strong colour for instance, such as the khaki here. Interestingly, as with many checks this one is brought alive by its overcheck. The vibrant orange brings the pattern together, lifting the otherwise potentially turgid black and green. Handkercheif folded square and then stuffed casually, as I like it. One point appears to have twisted downwards, which is a nice accident (or is it?). Vintage folio as featured before, briefly. I’ll write a separate post on that next week. You can follow the discussion on Checked jackets and accessories by entering your email address in the box below. You will then receive an email every time a new comment is added. These will also contain a link to a page where you can stop the alerts, and remove all of your related data from the site. Like this jacket very much. I think the way you paired it here is pretty much perfect. I think jackets like these work best with textured solid ties: knits, cashmere, herringbones etc. Although, a block stripe might work. A white shirt should also work with the jacket. Maybe i got it wrong as i read this quickly on my phone but are you advocating ‘black trousers’? If so, i vehemently disagree. No, not at all. I say that often navy trousers vary quite a lot by the amount of black they have in the weave. And it’s worth watching out for because it makes the navy hard to wear with anything other than black shoes. More a problem these days than it used to be. Navy requires black shoes? Can’t believe I read that correctly — or that you actually said it. IMO, Navy pairs beautifully with deeply patinated cognac or chestnut leather. I’m not sure people actually read my writing. No John, as mentioned to Incognito – who also didn’t read the post – only navy trousers that have a lot of black in the weave can have that issue. Very useful observation. A reminder that it’s always worth stepping outside the shop to look at fabrics in daylight. I picked up a GB suit last year in navy lumb’s golden bale. Although I spent a lot of time looking at cloths in the shop, it took me a further 6 months to realise that there’s some black woven in with the navy (not a problem for me as I only wear black oxfords with suits). Great look Simon. What are the trousers? Thanks. Slim fit version or regular? Simon, can you do a post about the bespoke casual movement? i note that you have commissioned some casual pieces (e.g., leather jacket) from what i would consider traditional savile row tailors. but there are some tailors (e.g., tim everest, lee marsh, others), who seem to specialize in casual/fashion-y pieces. that seems to be where the growth in the bespoke market lies. would appreciate your thoughts on this. Well that leather jacket of yours was definitely a success. If it was remotely within my price range, I’d order the exact same thing. forgot to mention, this look is Bruce Boyer-ish, no? Really love this outfit! 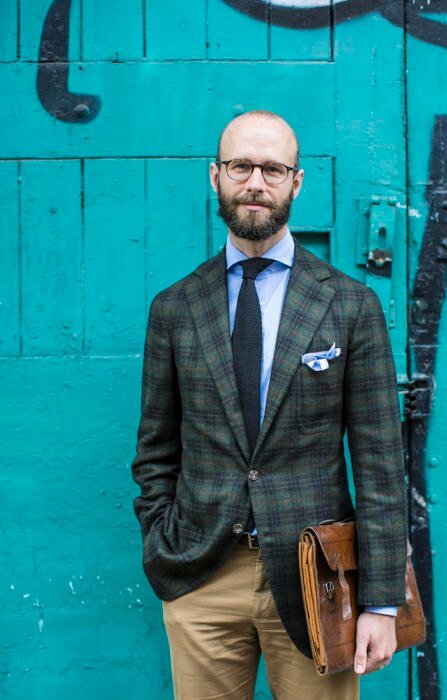 It’s a particularly nice alternative to all-too ubiquitous (but ever so useful) “California tuxedo” of blue cotton jacket with beige chinos. Hi Simon, nice post. Thanks! I am not sure it is the photo only but the button stance seems a bit low to the desire position? Is it lower than your others jacket? Btw, i still look forward to your further photos and details of your green top coat. I’m specifically interested in the belt design. I just can’t understand how it work. No, it’s pretty standard. In fact even a touch high given the relatively short length of the jacket. I can do something specific on the top coat belt if you’d like, and it’s not clear from the original post. Thanks Simon. An extra post on the topcoat will be very much appreciated. I am going to commission my first topcoat soon and wanna steal ideas from yours, which look perfect to me. In relation to the too-much-black concern for some navy, do you think Hassisons of Endinburgh Overcoating bunch 83914 too black for a versatile top coat? Agree that finding the tinniest, least obvious thread gives one guidance for harmoniously colored accessories. However… you did mention Rubinacci (Donegal) which made me think of Luca, who has an incredible sense of color, and who probably doesn’t give a fig about ‘matching’ a damn thing. I realize his sensibility is not everyone’s cup of tea, but his approach (when practiced even to a lesser extent) is liberating. That’s a great look. I’m curious, though–what shoes are you wearing? Hello Simon, the chinos are RTW of course, but wouldn’t you have your trousers cut just slightly higher if you were to choose? That has been my only hesitation so far about the otherwise much lauded Incotex chinos. The colour works very well with the overcheck. That’s true, yes I would have them a touch higher. Hi Simon, I really like the cloth. 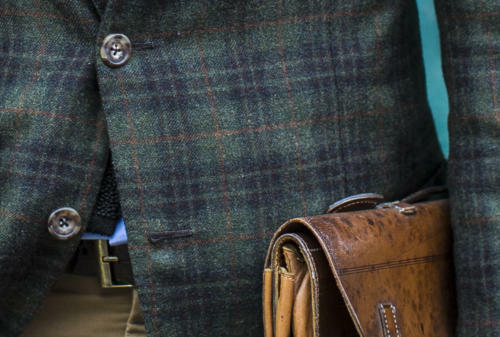 I use a regional tailor who has bunches from the standard English and Scottish mills, but I don’t recall seeing any British equivalents of this type of cloth. Are there any equivalents you can think of (even in palate without luxury fibres) for those of us who don’t have access to bunches of old Italian cloth? Many thanks. Simon, what about briefcase ? Old bridle ? I like it…aged and “sapore”. More on that soon, as mentioned at the end of the text……..
Maybe you could try Molloy & Sons of Donegal (Ireland) the cloths seem to be very beautiful almost ‘trendy’ tweed and they are Irish, so presumably your tailor will have easy access. Also, W Bill, old time favourite, has an “Italian” bunch. Oskar, you could always try Rota. They make a lovely garment washed chino with a higher rise than Incotex (although probably not high enough to call them truly high rise.) My only complaint is they only offer a button fly, which I find… annoying. I notice that this jacket has a fairly low button stance compared to some of the others featured on the site Simon. Do you have a particular rule or guideline you use to determine the button stance when you have a jacket made? I’m quite small and find that I get lost in jackets with a high button stance. The collar shape combined with the gorge are about as good as you could get in my view. Nice. The jacket looks very different here. I can’t decide whether it looks better paired with the chinos or the charcoal trousers. Have you ever considered putting the details of each item of clothing that you’re wearing at the bottom of the post? Surely it would save everyone a lot of time. I’m sure you must have covered it elsewhere but what is the cloth weight of this green plaid jacket and your navy cashmere from Solito. I’ve identified a cashmere cloth which is 280g (9/10oz) but seems very light weight to me. What’s your view on this from the point of view of fit/drape only? The green plaid is 9/10 ounce I believe. A little too light, as you say, but I really liked the design.